These two letters were written by Sergeant James Lemuel Yates (1828-1912) of Company C, 106th Illinois Infantry. James was the son of Rev. Stephen Yates (1799-1875) and Catharine Bush (1804-1887) of Caroline, Tompkins County, New York. He was married to Susan Norwood (1823-1899) in May 1850. Their daughter, Patty Jenna Yates (1854-1937), was born in February 1854. 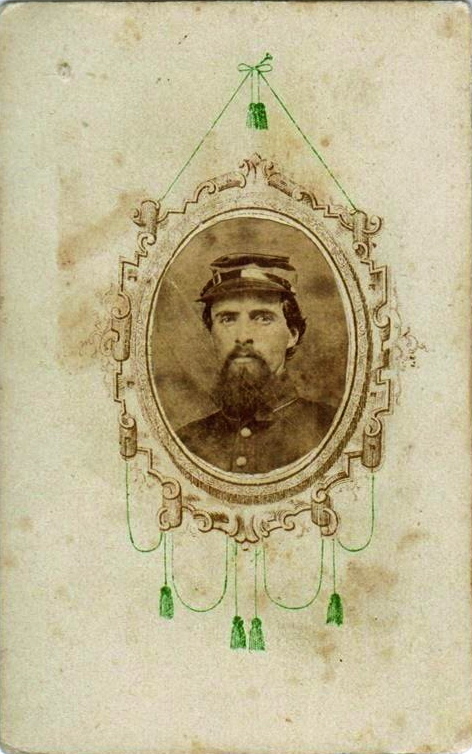 Yates enlisted in the Army on July 22, 1862, in Logan County, Illinois, and on September 17 he was mustered into the 106th Illinois Infantry. He mustered out at Pine Bluff, Arkansas, July 12, 1865. He returned to Logan County, where he worked as a carpenter and died there in July 1912. 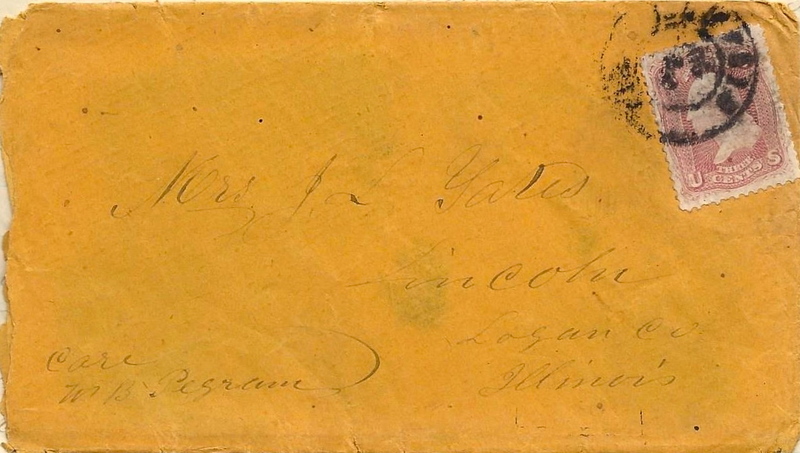 Yates mentions his captain, Benjamin B. Pegram, in the 25 July letter who was also from Lincoln, Logan County, Illinois. The first letter is undated but was probably written just before the fall of Vicksburg in the summer of 1863. I received a letter from you yesterday 14th post date 16th. I am always so glad to get a letter from you. You must try to be more hopeful and not so desponding. Try to look on the brightest side always, trusting in the goodness of him who ruleth over all and doeth all things well. Only think how merciful and gracious the Lord has been to us. Let us not distrust or think Him less willing to take care of us and to do all things well. O let us look with more confidence and faith to Him for the time to come when these trials or separation shall be ended when the war shall come for come it must. It cannot always last. There is no doubting the matter that the purposes of Jehovah are being accomplished every day, and then the end will come. My faith in the final issue is not diminished. And when these days are past and we are again permitted to enjoy each other’s society, we shall be the happier knowing that it is all of the Lord who saved us amid the storm. And if we trust Him, he has promised to bring us to the Land of Bliss at last. I am trying to take the best care of myself that I can and do what I can for those with whom I have to do. I could not sit down and do nothing if there was anything that I could do for the good of the rest that I could do. You know how much was depending on me. I am glad I have been able to see to most of it. If I could not do the hardest of the work, the men who are well have enough to do to have the burden taken off by every hand that can help a little. You also know how it was for them to go on picket and then they have had a good deal of fatigue duty to so since we have been here, which saved us from fighting. It was the rifle pit that we dug, the timber that we cut down, and the breastwork, and places of defense that were made that saved us from the deadly conflict. This is what makes Grant a general — his preparation to meet or to attack the enemy. But I suppose our work here is accomplished. We were here to keep [Gen. Joseph Johnston from getting to Vicksburg and it proves we were just in season. But I must bring this to a close. Baker showed me a portfolio he got at St. Louis. Then he told me you tried to get one to send to me. If there is more or any good ones in Lincoln [Illinois], Mr. Johnson will or says he will try to buy one on the road. We have no orders to move yet today and we may stay here several days yet. My respects to all our friends who enquire. The Adjutant [Charles H. Miller] is well. George is well. Bro. Eveley is pretty well. I told him about writing. Said he must write to you. How much love I would like to send to you this morning but I have not the way of communicating or transporting it but I love you with all the love and my affection for you, that I am capable of having or bearing towards you. Now it is time for me to put this in the office. Through the good providence of our gracious Heavenly Father, I am alive and well this morning. I think I can write this to you with safety. I can’t say I am very strong and this is not a seldom complaint. A good many of the men are weak down here. For the last few days I have been gaining fast. I went out in the country yesterday 5 or six miles for the first time since I was first taken sick but a little ways. I thought where our camp was was a rough place, but out from here beats it a long ways. I went with the men after beef, got two cows [and] did not get back till after dark. When I got home, found Captain B[enjamin] B. Pegram in camp. Looks as natural as ever. Said he had a warm reception when he came, but I suppose he will write home all about it so I need not do it. As you will see, we are yet at Snyder’s Bluff awaiting transportation. I think we will leave about tomorrow. It being Sunday, that is our day to move. I do not know how far we may go up the river. We are ordered, I understand, to report at Helena [Arkansas]. Whether we will pass there or stop is yet uncertain entirely so to us. I have no news to write this morning at all — just a perfect monotony here. I think the health of the regiment is somewhat improved yet quite a number are off duty. Levi [Altick] is much better; reports for duty this morning. I have given John Gardiner of Company H my likeness to take to you. If I had not had it taken till now, it would [have] looked much better but the shop is gone. I expect Albert C. [E.] Johnston [Johnson] will go home on a furlough from our company. If he does, he has promised to see you and will tell you all about how we do &c. If I had one of Jenna’s sheets of paper I could write it full but I do not know as I find enough to fill this now. If Mr. Johnston comes — and I think he will — you may send me some but need not be quite so small; big enough so I can tell you that I love you a good deal; so much that you will not be ashamed of them. If I could see you this morning. O how much I love you. How can I tell you with this pen on paper? But if I could embrace you as I would could I meet you and give you a dozen dozen kisses, then I might begin to think about telling you something about it. How gladly would I accept the invitation to a share of your bed. O yes, all those find embraces which I could have were I with you. You may send me a portfolio to carry my paper in. I will send you the money to pay for it. I sent you five dollars in my last letter. Forgot to write in it anything about it. That I think was my ninth letter for July. This is the 10th if I have not miscounted. You can tell by the dates. In the order of Providence, we are still in camp at Snyder’s Bluff. I am well this morning. Tell Mary Baker her Captain — if she is like Mrs. Vanhise or Baker — is well. Uncle Henry is well. John [F.] Hough is very sick. Otherwise we are doing very well, or not any of us dangerous. Robert Shields is sick and the two Bowles [Robert and Charles], but not serious. We as a company have been favored much; we have not lost a man since we have been down here, nor had any in the hospital in we can. The Dr. has just come round and ordered his description role. Says he will try to send him to St. Louis. O my dear wife & child, I do want to see you so much. I have so many things to tell that I can never tell with the pen satisfactorily. I received a letter from you yesterday — your 13th. Last date 16th. I am always so glad to get a letter from you. You must try to be more hopeful and not so desponding. Try to look on the brightest side, always trusting in the goodness of Him who ruleth over all and doeth all things well. Only think how merciful and gracious the Lord has been to us. Let us not distrust or think him less willing to take care of us and to do all things well. O let us look with more confidence and faith to him for the time to come when these trials or separation shall be ended when the end of war shall come for come it must. It cannot always last. There is no doubting the matter that the purposes of Jehovah are being accomplished everyday. And then the end will come. My faith in the final issue is not diminished and when these days are past as we are again permitted to enjoy each others society, we shall be the happier — knowing that it is all of the Lord who loved us amid the storm. And if we trust him, he has promised to bring us to the land of bliss at last. I am trying to take the best care of myself that I can and do what I can for those with whom I have to do. I could not sit down and do nothing if there was anything that I could do for the good of the rest that I could do. You know him much was depending on me. I am glad I have been able to see to most of it. If I could not do the hardest of the work, the men who are well have enough to do to have the burden taken off by every hand that can help a little. You also know how it was for them to go on picket and then they have had a good deal of fatigue duty to do since we have been here, which saved us from fighting. It was the rifle pit that we dug, the timber that we cut down, and the breast work, and places of defense that were made that saved us from the deadly conflict. This is what makes Grant a General — his preparations to meet or to attack the enemy. But I suppose our work here is accomplished. We were here to keep [Joseph E.] Johns[t]on from getting to Vicksburg and it proves we were just in season. But I must bring this to a close. Baker showed me a portfolio he got at St. Louis. Then he told me you tried to get one too. Send to me if there is none or any good ones in Lincoln. Mr. Johnson will — or says he will — try to buy me one on the road. We have no orders to move yet today and we may stay here several days yet. My respects to all our friends who enquire. The Adj. is well. George is well. Brother Everley is pretty well. I told him about writing. Said he must write to you. How much love I would like to send you this morning but I have not the way of communicating or transporting it. But I love you with all the love and my affection for you that I am capable of having or bearing towards you. Now it is time for me to put this in the office. I remain your own dear husband and father, knowing you to be my true wife and child. This entry was posted on Sunday, June 1st, 2014 at 5:28 pm	and posted in Uncategorized. You can follow any responses to this entry through the RSS 2.0 feed.